North Eastern Indira Gandhi Regional Institute of Health & Medical Sciences (NEIGRIHMS), Bihar Patna has published advt. 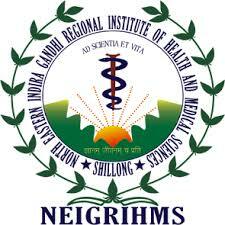 NEIGR-E.II/10/97/Pt.-XIV for 45 Junior Resident and Senior Resident Doctor Vacancies in NEIGRIHMS. Applicants who having Post Graduation Degree or Diploma can apply through the prescribed format before 10.11.2015. Applicants may send application form to North Eastern Indira Gandhi Regional Institute of Health & Medical Sciences (NEIGRIHMS office. Applicants form is available on North Eastern Indira Gandhi Regional Institute of Health & Medical Sciences (NEIGRIHMS website. I. Postgraduate degree or diploma in respective subject recognized by MCI after obtaining a medical qualification included in the Schedule – I & II of the 3rd Schedule of Indian Medical Council Act 1956 (persons possessing qualifications included in the part – II of the 3rd schedule should also fulfill the conditions specified in section 13 (B) of the Act). ii. Satisfactory completion of the compulsory internship/horsemanship in a recognized hospital. Age relaxation is applicable up to 5 years for SC and 3 years for OBC candidates as per Government of India Norms. I Senior Resident Doctor- Rs.18, 750/- + GP – Rs.6600/- + NPA plus other allowances as admissible under the Central Govt. Rules in identical posts. II Junior Resident Doctor- Rs.15, 600/- + GP – Rs.5, 400/- + NPA plus other allowances as admissible under rules. How to apply: Eligible applicant require to send attend the interview along with attested copies of relevant certificates and originals on 10.112015 from 11:00 AM Onwards. Write on the envelope “application for the post of Junior Resident and Senior Resident Doctor”. Date & Time of Interview: 10.11.2015 from 11:00 AM Onwards. Registration Time: 09:00 AM to 10:30 AM. Venue: Administrative Block, NEIGRIHMS, Permanent Campus, Mawdiangdiang, Shillong–793018.